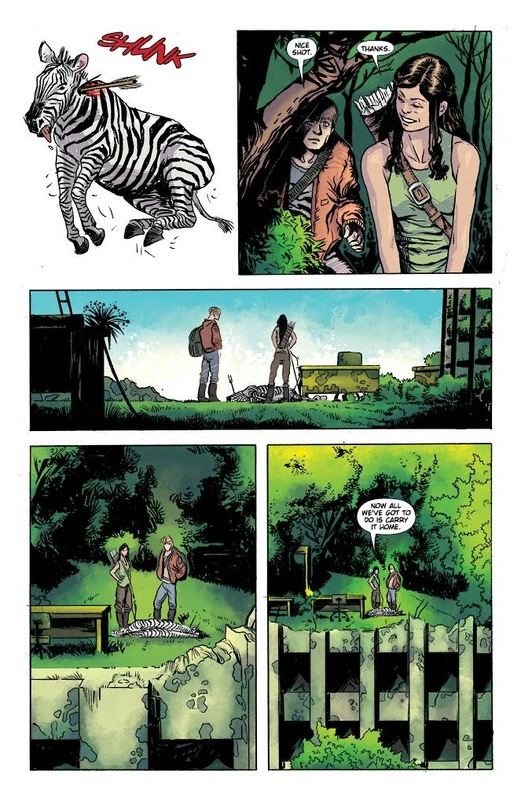 The first thing of note to occur in Hinterkind number one is on the second page when the protagonist Prosper Monday jumps out of the brush and shoots a zebra. Artist Francesco Trifogli uses a repeating-image of the hunter Prosper superimposed over a still environment to indicate not only her precise movements through space but also to imply the speed and clarity of her action. It’s an old comics trick but it’s a trick that I like. It requires more work and it telegraphs to the audience that the artist isn’t shy to put extra effort in when the situation warrants. That was on page two. Got my attention. The rest of the comic holds my interest based on two factors: colorist Cris Peter’s tone-streaking texture style and Trifogli’s figure placements. 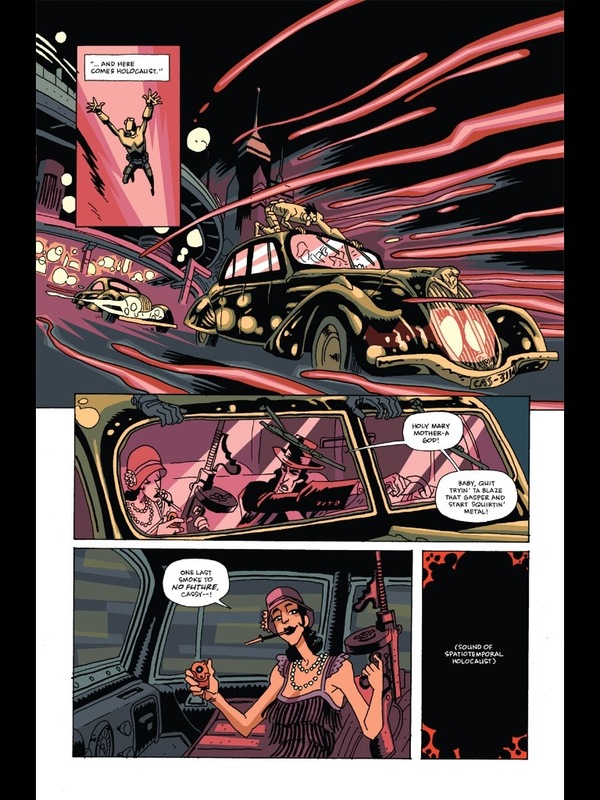 The colors in Hinterkind start out with a fairly literal base color and the human figures are then hatched with a secondary tone that gives the appearance of a surface that has been scraped. Faded by abrasion. The technique is effective in the scenes where characters are traveling under the canopy of a forest-dominated New York City. Peter also uses the technique to ad depth shade to foregrounded characters who are not the focal characters in a panel. This “scraping” technique is also used to fade out details in panel that portray the characters from a distance. In these three ways (four, if you add “just to add texture in a panel) give Cris Peter a voice in Hinterkind that feels as prominent as the voices of Ian Edginton and Francesco Trifogli. An aspect of this book that began to take shape in my mind toward the end is that Trifogli depicts the full figure inside the panel. 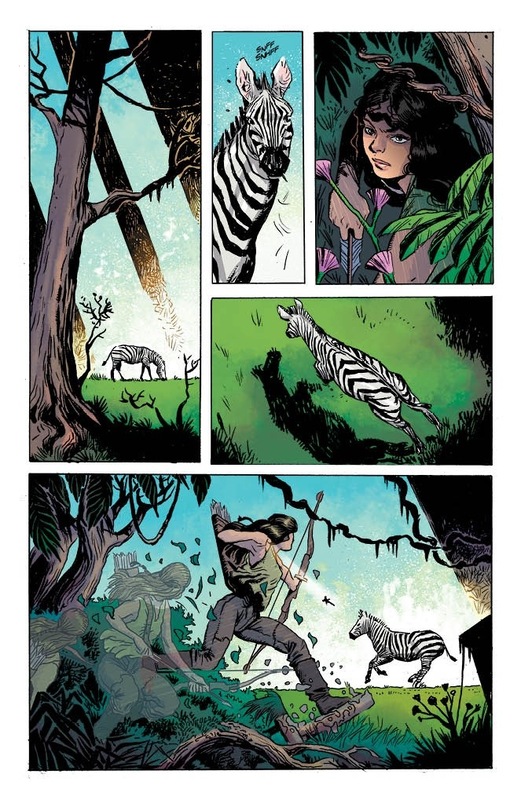 I need to go back and compare against other contemporary comic books but it seems like Trifogli uses slightly more than average full-body depictions, particularly when the main characters leave their village and venture into the dangerous woods. I feel like there is something personally important to me about depicting a full human (or humanoid) figure in the woods. Something at once wild and serene. In Hinterkind, the woods present only brutal danger; the threat of being torn apart and eaten. Eaten by lions, eaten by ogres. Humans are food. Part of making that danger feel real on the page is Trifogli’s decision to diminish the scale of the human figures. They are visually and figuratively swallowed by the wilderness. The human characters are depicted much larger when they are safe inside their village. Considering how violent Hinterkind is, the comic feels quite relaxing in many ways. There’s a lot of interpersonal dialogue about relationships. Both among known and yet-unknown characters. Writer Ian Edginton wants the community of humans to feel fleshed out and concrete, even though the thrust of the story drives the principle characters out of the village. It’s a smart technique because it makes the village seem like a real place that will be missed and gives readers a reason to want the characters to return. Adventure is ahead but the characters do have a home. ← Secret Agents of S.H.I.E.L.D.